Mouth-watering barbecue. Photo by Peter Hellebrand. PHYLLIS HASKINS, who teaches and writes on the fine art of barbecue, is the co-owner of Teddy Bear’s BBQ in Monroe, Washington. She and her husband Konrad have won more than 70 awards in BBQ competition since 2002. To study BBQ with the masters, e-mail Phyllis. CAPSULE REPORT There’s a lot to learn to master the grill. Author Phyllis Haskins teaches classes, and we’ve recommended several books. This is Page 1 of a seven page article. Click on the black links below to visit other pages. Many people make barbecue a complex, almost mystical process. Even though our roots are in the world of competitive barbecue (under the name Teddy Bear’s BBQ), we started The BBQ Institute in 2004 to help cooks cut through the sometimes-conflicting information that surrounds the world of barbecue, and to provide simple, stress-free procedures for cooking mouth-watering dishes for friends and family using home equipment. We are great believers in simplicity. The simpler the process and the recipe, the easier it is to repeat the same great results. Complex recipes are a deterrent for many people. We want as many people as possible to enjoy great barbecue as often as possible. 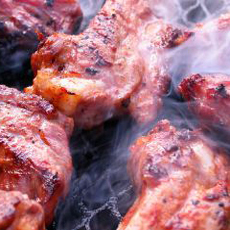 The trademark of “real barbecue” is the presence of smoke in the cooking process. Smoking woods of choice come from seasoned hardwood, preferably fruit- or nut-bearing trees: apple, cherry, guava, hickory, maple, pecan and oak. Mesquite and alder are weed trees popular because of the plentiful supply of cheap or free fuel—the best barbecue doesn’t use them. A smoker running as intended should generate no smoke or a barely visible trace of blue smoke—the smoke in the photo above looks romantic, but if your smoke resembles a steam train we hope you like a really strong smoke flavor (most people do not). Using the wrong kind of wood can be hazardous to your health: stay away from anything evergreen because it will release harmful resins into your food. We are not big fans of smoke from damp wood chips. We prefer to use dry chunks placed next to the charcoal or propane flame. If all you have is chips or pellets, our favorite trick is to use a small cast iron spoon rest. The spoon rest looks like a miniature cast iron frying pan. Fill it with dry chips or pellets, wrap in a double layer of foil and poke a single toothpick size hole furthest from the handle. Place the handle directly over the heat source. Some purists feel that using gas is not real barbecue. Maybe it’s not from a traditionalist’s standpoint; but if you know what you are doing, you can turn out food that tastes just as good with gas or wood as a heat source. As an example, we love the new portable Weber Q gas grill: it sits proudly next to our charcoal kettles and it cooks fantastic chicken! 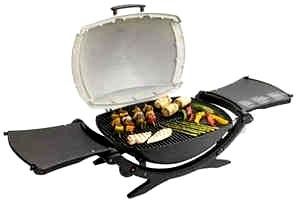 The Weber Q portable propane gas grill with an enameled cast-iron cooking grate does the trick. Click here for more information or to purchase. “Low” refers to the cooking temperature, which in the barbecue world is in the 225º to 275ºF degrees range. Chicken, which we will be focusing on later in this article, needs a little more heat to get the skin to a point that is crisp and nice to eat. If you maintain a constant low point of 200ºF, food can dry out and stay in the “Danger Zone” too long*. Many experienced cooks these days achieve winning results breaking the low temperature rule. You just need a little knowledge and experience to successfully use higher temperatures. *The danger zone refers to the temperature at which bacteria and their associated toxins multiply rapidly. It is usually recognized as 42ºF and 139ºF. Food should not be kept at these temperatures for an extended period of time. “Slow” means a cooking time of anywhere from 2 hours for a whole chicken to 10 hours for a pork shoulder. However, don’t get hung up on time. The meat is ready when it is safely cooked based on internal temperature AND has achieved the desired texture and tenderness.